United States Public Health Service (USPHS) officers stationed in the San Francisco Bay complained about the rain and deer eating the garden as they carried out the work of inspecting recent arrivals for signs of disease. We know they had a minor deer problem on Angel Island because the Medical Officer in Charge (MOC) made note of it in the station journal, a handwritten log of daily activities. This is but one of the many eccentric, fascinating, and mundane entries in one of the station logs kept by the Marine Health Service that can be found in the Archives and Modern Manuscripts collections at the National Library of Medicine. The station journals for the San Francisco Quarantine Station on Angel Island cover 43 years (1903–1946), spanning two World Wars, the 1918 influenza pandemic, Japanese internment, changes in immigration policy, advances in bacteriology and virology, the development of antibiotics, and so much more. Each day (more or less) the MOC wrote a few lines about the station’s activities. Entries varied slightly by MOC but conform to a fairly standard format, tone, and scope of content. Most of the time, the MOC recorded information on the weather, staff changes or requests for leave, ship inspections and fumigation or disinfection, the status of quarantined patients, building repairs, official visitors to the station, instructions from USPHS leadership, etc. Sometimes, the MOC included newspaper clippings or other pieces of ephemera related to their work. Only the most important events, like the WWI armistice and attack on Pearl Harbor, made it into the log. The logs offer researchers important data about the workings of a US Public Health Service Immigration Station. Individual entries can be a bit dull (for example, days where the only note was “rain”). They offer up granular, if brief, detail about the work required to keep the station running, individual staff appointments, and specific cases of disease. Taken as a whole, the logs provide a fascinating account of on-the-ground responses to epidemics, policy changes, and life as a USPHS officer (entries mention everything from meritorious service to public intoxication around the holidays). 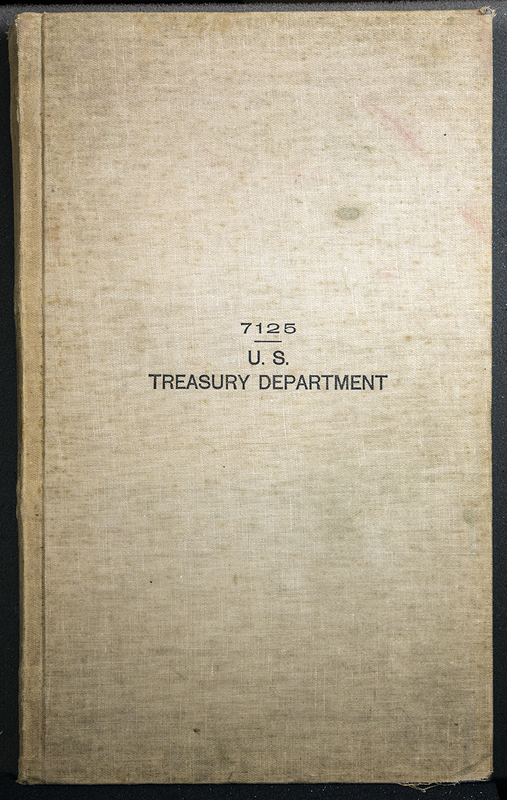 The notes from MOC W. A. Korn, who managed the Angel Island station through the 1918 influenza pandemic, epitomize the journals’ balance of the specific and the general, the local and global. The 1918 flu pandemic moved through the United States in waves. The first cases broke out at an army camp in Kansas in March 1918 but go unremarked upon in the quarantine station journals. In March 1918, the men working on Angel Island were more concerned about painting the outbuildings and managing the bids for station supplies than the flu. In fact, entries for the entire month of March 1918 take up just a little over two pages. Although it was a more mild infection that spring than it would be in the fall, it is difficult to imagine that Korn and his staff were unaware of the flu in Kansas. If they made any efforts to prepare for a flu pandemic, these were not recorded in the station logs. Throughout the spring and summer, the staff reported cases of cerebro-spinal meningitis, small pox (“varioloid”), and an unconfirmed case of yellow fever. It was the second wave of influenza infection, in the autumn of 1918, that brought the flu to Angel Island. On October 7, 1918 MOC W. A. Korn boarded a ship and discovered “several cases of influenza aboard. Health Officer of San Francisco notified. Otherwise all well.” One week later, on October 15, the rate of new influenza cases at the station began to pick up. 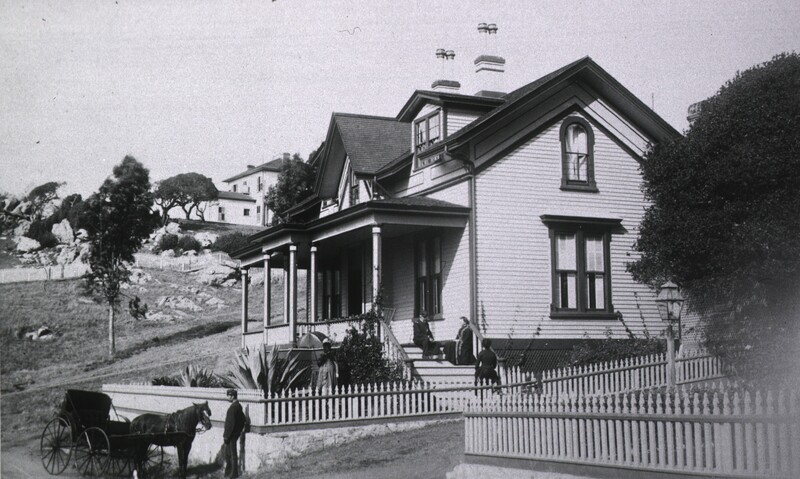 Thirty-five navy cadets suffering with influenza were transferred to the station for treatment and the Marine Hospital in San Francisco transferred its chronic patients to the Quarantine Station in order to free up space for treating influenza patients. The station also converted one of its dining rooms into an influenza ward. On October 22, one of the assistant surgeons was assigned “special temporary duty during the influenza epidemic” and transferred away from the station. Eventually, over 80 flu patients were on the island. Nevertheless, life at the station continued apace. The staff still inspected ships and made note of any illnesses on board (usually influenza). Although the flu disrupted some of the staff’s normal routines and increased the total number of patients in their care, it did not prevent them from attending to the regular, necessary tasks associated with running the station. Korn continued to record activities like building repairs, painting, fire drills, ship inspections, resignations, and requests for leave. The consequences of the influenza epidemic rarely make it into the log, a surprising omission given how deadly it was. Modern estimates place the death toll at 50 million people worldwide, dwarfing the 16 million casualties in World War I! On November 6, Korn noted that one of the clerks was “home sick with influenza.” The clerk died nine days later, on November 15, 1918. The report of his death was the only entry Korn made for the day. The log book does not include any information about how Korn or his staff responded to the clerk’s death but it is notable that this is the sole influenza death he mentioned. Other people certainly died of the flu on Angel Island; October 1918 was the deadliest month in a deadly epidemic, but those deaths do not make it into the station’s log—even as an aggregate number (e.g. “x patients died” or “x buried/cremated/sent to city morgue today”). Korn did not record what, if any, efforts the staff made to mark the passing of a peer. By early November, the flu recedes from Angel Island and the log book. On the 9th, the last of the naval cadets were discharged and by the 11th a group of ten men from the Naval Training Station at Goat Island (Yerba Buena Island) arrived to participate in experiments to identify the causal agent of influenza. Their arrival and a brief note about the experiment got slightly more attention than the armistice. After November 11th, the log book essentially returns to normal: staff changes, repair work, ship inspections, and a meeting about converting Angel Island into a Leprosarium. 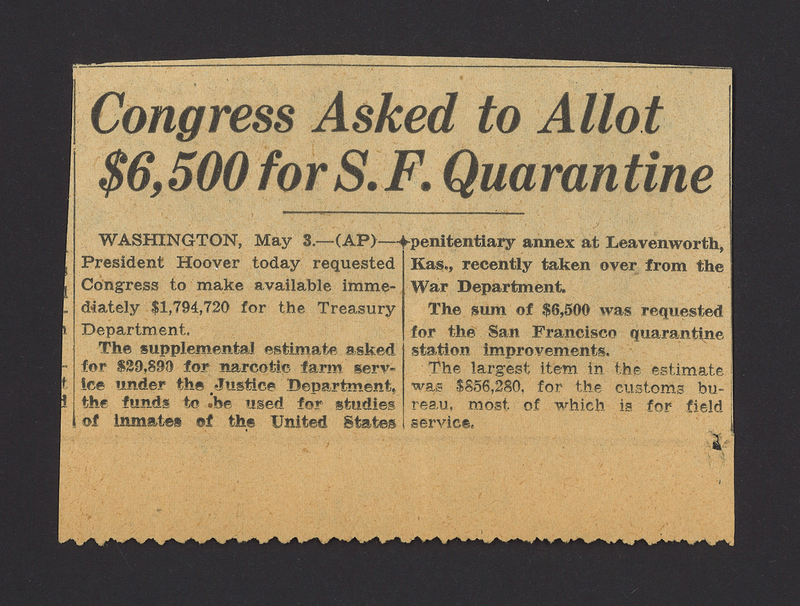 A few cases of influenza among the staff were mentioned in the following months but not among the passengers or crew arriving in San Francisco. What makes these station logs fascinating, their ability to juxtapose the mundane and the important, is also their limitation. These short entries hint at much larger stories—about epidemics, serving in the USPHS, immigration, war, crime, climate, and so much more—but by reducing all of these activities to just a few lines of facts, the log can create a sense of false equivalence between, for example, the arrival of 35 sick sailors and repainting the pharmacy. 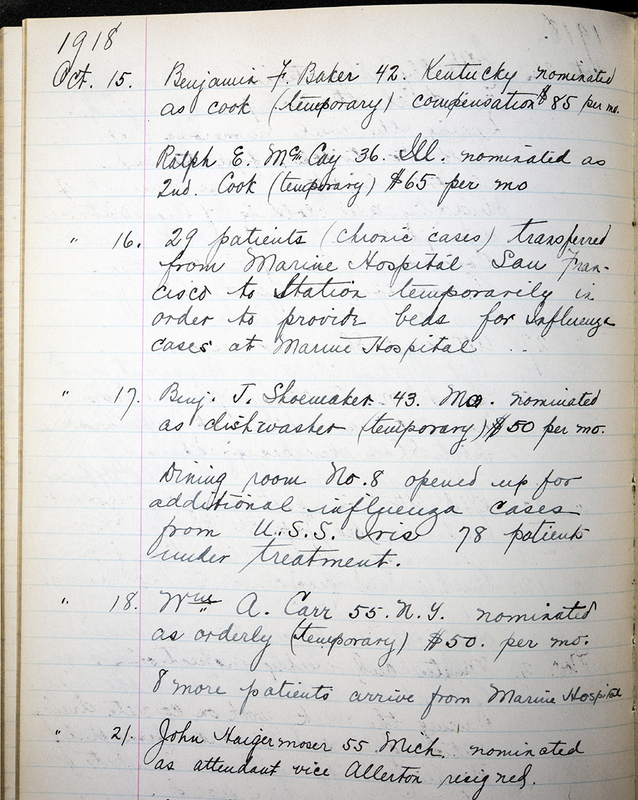 In addition to this record of 43 years of daily life at the Angel Island Quarantine Station, the National Library of Medicine has station logs for six additional immigration and quarantine stations that operated in the 20th century: The Gulf Quarantine Station on Ship Island, Mississippi; the San Diego Quarantine Station at Point Loma, California; The Boston Quarantine Station on Gallop’s Island, Massachusetts; the US Marine Hospital in Fort Stanton, New Mexico; the Port Townsend Quarantine Station in Port Townsend, Washington; and the United States Insular Quarantine Station in Honolulu, Hawaii. We hear about data every day. In historical medical collections, data abounds, both quantitative and qualitative. In its format, scope, and biases, data inherently contains more information than its face value. This series, Revealing Data, explores how, by preserving the research data of the past and making it publicly available, the National Library of Medicine (NLM) helps to ensure that generations of researchers can reexamine it, reveal new stories, and make new discoveries. As the NLM becomes the new home of data science at the National Institutes of Health (NIH), Circulating Now explores what researchers from a variety of disciplines are learning from centuries of preserved data, and how their work can help us think about the future preservation and uses of the data we collect today. Ashley Bowen, PhD is a contract collections researcher in the Exhibits Program at the National Library of Medicine.